Nanotechnology takes atoms and particles at the molecular or macromolecular level and changes them to have an impact on our life. 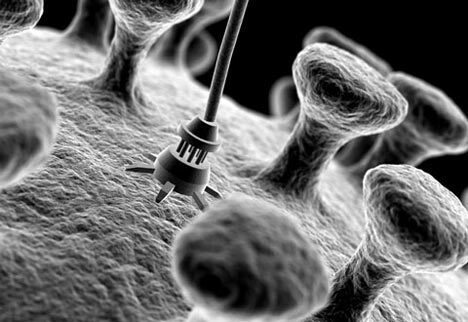 A nanometer is one billionth of a meter, in other words really, really small. A nanometer is about the size of three atoms. Nanotechnology is a sort of building, or engineering, something one atom at a time. Some people refer to nanotechnology as “molecular manufacturing” or “nanoscale technology”. Nanoscale technology is usually referring to very small structures (i.e. for things 1 to 100 nanometers). In any case, the terminology is often used interchangeably. Eric Drexler was the founder of molecular manufacturing. In the 70’s, Drexler, an under- graduate student, came up with the concepts of molecular manufacturing. He later obtained his Ph. D. from MIT. He found that molecular machines could be used to put together complex products made up of chemicals. Drexler produced several scientific articles on molecular manufacturing. In 1986 he published a book, Engines of Creation, that discussed molecular manufacturing and the risks involved. In 1992, Nanosystems was published. In this book, Drexler lays out how to manufacture high-performance machines out of a molecular diamondoid. He founded the Foresight Institute in 1986. There are five criteria for molecular manufacturing that include: (1) digital operations, (2) construction on a nanoscale (3) self manufacture (4) properties that are programmable and (5) few mistakes. Manufacturing at the molecular level has all atoms in their proper places to build products, devices, or even machines. This technology is getting closer and closer to being introduced. Molecular manufacturing will allow for products to be produced cheaply, but there are some risks involved as well. The risks are many. There is the fear that the technology could get into the hands of criminals or terrorists. The use of molecular manufacturing for producing weapons, arms or surveillance devices could be a real danger. There are also economic risks with a larger supply of cheaper products on the market. There are many other risks as well. So, planning and understanding molecular manufacturing is critical. Just as there are many risks involved, there are many benefits. Computers could have more power and be much smaller; electrical power would be more efficient and have much less loss; materials could be created that are much stronger than steel, all through the use of molecular manufacturing. There are a myriad of benefits for molecular manufacturing. Uses of molecular manufacturing are also numerous. There would never be a shortage of water with the use of molecular manufacturing. Food shortages as well as infectious diseases could be helped. Molecular manufacturing does not cause pollution and provides a clean, self-contained system. Cheaper medical and health care offerings would also be an additional use. Nanotechnology has the potential to have a great impact on almost all industries. The molecular manufacturing allows for us to build cleaner products, stronger products and smaller and smarter products. Products that make use of nanotechnology will be used at home, for drugs and medicine, agriculture and for transportation, to name a few of the industries that can benefit from nanotechnology. There are two different ways to approach nanotechnology. The two terms to describe the different approaches are “top down” and “bottom up”. “Top down” is when you make nanoscale structures by using machining and etching. The “bottom up” refers to building structures atom by atom. By re-arranging the molecules, scientists are able to build atom by atom. They are able to create stronger materials by placing atoms where they want. They can create surfaces that are smoother and stronger. The truly fascinating part about nanotechnology is the truly multidisciplinary aspect. The research involves all sorts of scientists from many different disciplines. Physics is important for the understanding of what and how things will affect atoms and molecular structures. Mechanical and electronic engineers are teaming with materials scientists and collaborating with biologist, chemists and physicists. Nanotechnology is simply fascinating. The idea can affect electronics, engineering, electromechanical systems, and biomedical applications including gene therapy, drug development and delivery, to name but a few areas. The payoffs are tremendous but the risks are high. Stay tuned to see the great strides made in the next few months. you're reading my article in my blog Nanotechnology and you can find something Nanotechnology ini dengan url http://technologyfactory.blogspot.com/2011/12/nanotechnology.html, you can publish and copy paste for you Nanotechnology it's very use full Nanotechnology sumbernya.